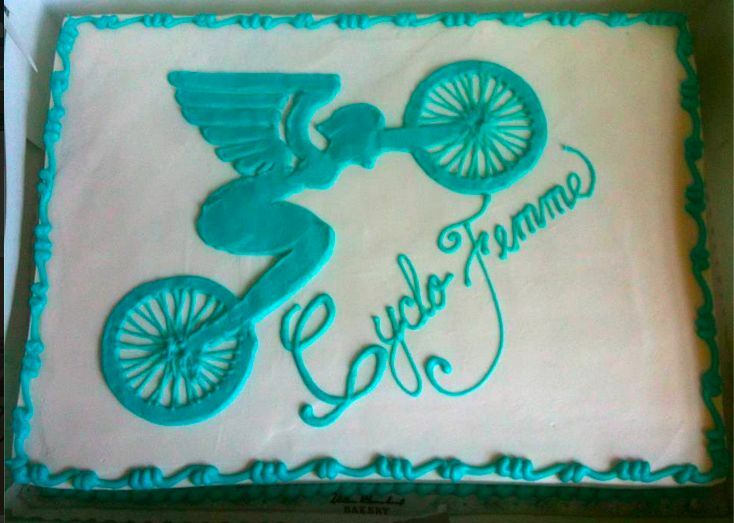 Last year was the first CycloFemme ride, on May 13, 2012. As soon as I heard that someone was organizing a 'national' ride for women I got interested. But I wondered what kind of ride it might be - lycra and toe-clips? Cyclocross sweat and mud? Pretty bikes and pretty outfits? Well, it turned out it was all three and more. Sarai Snyder, CycloFemme's organizer, had the great idea not to try to prescribe a specific ride - instead she just wanted to facilitate getting everyone to plan and start rides on the same day. That was enough for me, and with help from a lot of friends, we did a Portland CycloFemme ride. Sarai must have done something right (think excellent temporary tattoos, and in the case of Portland's ride, funky blue balloons with the sleek CycloFemme logo and the cake you see above) because 163 separate rides took place, in 14 countries. Our ride in Portland was actually a trio of rides that came together for a one-mile parade. Women on Wheels riders showed up, Sorella Forte riders did a 30-mile ride to the ride, and a score of family riders from Kidical Mass helped make our parade on Sunday Parkways car-free streets fun and multi-culti friendly. California currently is the state with the most rides registered for this year's May 12, 2013 ride. Strangely there's no San Francisco ride yet registered. When I co-organized last year's CycloFemme PDX ride I was a little anxious, and it WAS a little chaotic for me on the day of the ride. I forgot to enjoy the cake and I was so busy helping people with the temporary tattoos that I actually missed the ride, only watching as the beautiful bikes headed out in the May sunshine. But the warm feeling of seeing so many women - and so many different types of riders - pull together for a bike ride that really just celebrates that women do bike - has had a positive lasting effect. So register a ride - even if it's just you and a friend. I love this blog! Great picture on top!! As bike chic/enthusiast I can only recommend this link where you can win a trip to berlin ( great for cycling ) to visit the DMY !